10 A None No Power Seat 10 A is an Open Suite style Business Class seat offering a seat that transforms into a fully-flat bed. The seat/bed is positioned against the wall and is separated from the aisle by a side table providing a private experience. 10 D None No Power Seat 10 D is an Open Suite style Business Class seat offering a seat that transforms into a fully-flat bed. The seat is slightly angled towards the aisle. 10 G None No Power Seat 10 G is an Open Suite style Business Class seat offering a seat that transforms into a fully-flat bed. The seat is slightly angled towards the aisle. 10 K None No Power Seat 10 K is an Open Suite style Business Class seat offering a seat that transforms into a fully-flat bed. The seat/bed is positioned against the wall and is separated from the aisle by a side table providing a private experience. 11 A None No Power Seat 11 A is an Open Suite style Business Class seat offering a seat that transforms into a fully-flat bed. The seat is slightly angled towards the aisle. 11 D None No Power Seat 11 D is an Open Suite style Business Class seat offering a seat that transforms into a fully-flat bed. The seat is slightly angled towards the adjacent seat. The seat and the one adjacent are ideal for couples traveling together. 11 G None No Power Seat 11 G is an Open Suite style Business Class seat offering a seat that transforms into a fully-flat bed. The seat is slightly angled towards the adjacent seat. The seat and the one adjacent are ideal for couples traveling together. 11 K None No Power Seat 11 K is an Open Suite style Business Class seat offering a seat that transforms into a fully-flat bed. The seat is slightly angled towards the aisle. 12 A None No Power Seat 12 A is an Open Suite style Business Class seat offering a seat that transforms into a fully-flat bed. The seat/bed is positioned against the wall and is separated from the aisle by a side table providing a private experience. 12 D None No Power Seat 12 D is an Open Suite style Business Class seat offering a seat that transforms into a fully-flat bed. The seat is slightly angled towards the aisle. 12 G None No Power Seat 12 G is an Open Suite style Business Class seat offering a seat that transforms into a fully-flat bed. The seat is slightly angled towards the aisle. 12 K None No Power Seat 12 K is an Open Suite style Business Class seat offering a seat that transforms into a fully-flat bed. The seat/bed is positioned against the wall and is separated from the aisle by a side table providing a private experience. 13 A None No Power Seat 13 A is an Open Suite style Business Class seat offering a seat that transforms into a fully-flat bed. The seat is slightly angled towards the aisle. 13 D None No Power Seat 13 D is an Open Suite style Business Class seat offering a seat that transforms into a fully-flat bed. The seat is slightly angled towards the adjacent seat. The seat and the one adjacent are ideal for couples traveling together. 13 G None No Power Seat 13 G is an Open Suite style Business Class seat offering a seat that transforms into a fully-flat bed. The seat is slightly angled towards the adjacent seat. The seat and the one adjacent are ideal for couples traveling together. 13 K None No Power Seat 13 K is an Open Suite style Business Class seat offering a seat that transforms into a fully-flat bed. The seat is slightly angled towards the aisle. 14 A None No Power Seat 14 A is an Open Suite style Business Class seat offering a seat that transforms into a fully-flat bed. The seat/bed is positioned against the wall and is separated from the aisle by a side table providing a private experience. 14 D None No Power Seat 14 D is an Open Suite style Business Class seat offering a seat that transforms into a fully-flat bed. The seat is slightly angled towards the aisle. 14 G None No Power Seat 14 G is an Open Suite style Business Class seat offering a seat that transforms into a fully-flat bed. The seat is slightly angled towards the aisle. 14 K None No Power Seat 14 K is an Open Suite style Business Class seat offering a seat that transforms into a fully-flat bed. The seat/bed is positioned against the wall and is separated from the aisle by a side table providing a private experience. 15 A None No Power Seat 15 A is an Open Suite style Business Class seat offering a seat that transforms into a fully-flat bed. The seat is slightly angled towards the aisle. 15 D None No Power Seat 15 D is an Open Suite style Business Class seat offering a seat that transforms into a fully-flat bed. The seat is slightly angled towards the adjacent seat. The seat and the one adjacent are ideal for couples traveling together. 15 G None No Power Seat 15 G is an Open Suite style Business Class seat offering a seat that transforms into a fully-flat bed. The seat is slightly angled towards the adjacent seat. The seat and the one adjacent are ideal for couples traveling together. 15 K None No Power Seat 15 K is an Open Suite style Business Class seat offering a seat that transforms into a fully-flat bed. The seat is slightly angled towards the aisle. 16 A None No Power Seat 16 A is an Open Suite style Business Class seat offering a seat that transforms into a fully-flat bed. The seat/bed is positioned against the wall and is separated from the aisle by a side table providing a private experience. The proximity to the galley and lavatory area might be bothersome. 16 D None No Power Seat 16 D is an Open Suite style Business Class seat offering a seat that transforms into a fully-flat bed. The seat is slightly angled towards the aisle. The proximity to the galley and lavatory area might be bothersome. 16 G None No Power Seat 16 G is an Open Suite style Business Class seat offering a seat that transforms into a fully-flat bed. The seat is slightly angled towards the aisle. The proximity to the galley and lavatory area might be bothersome. 16 K None No Power Seat 16 K is an Open Suite style Business Class seat offering a seat that transforms into a fully-flat bed. The seat/bed is positioned against the wall and is separated from the aisle by a side table providing a private experience. The proximity to the galley and lavatory area might be bothersome. 17 A None No Power Seat 17 A is a standard Premium Economy seat that offers additional legroom, seat width, and recline. The seat is located at a bulkhead. Floor storage for personal items is not available for use during takeoff and landing. The proximity to the galley and lavatory area might be bothersome. 17 C None No Power Seat 17 C is a standard Premium Economy seat that offers additional legroom, seat width, and recline. The seat is located at a bulkhead. Floor storage for personal items is not available for use during takeoff and landing. The proximity to the galley and lavatory area might be bothersome. 17 D None No Power Seat 17 D is a standard Premium Economy seat that offers additional legroom, seat width, and recline. The seat is located at a bulkhead. A bassinet might be placed on the bulkhead for use by a passenger traveling with an infant. Floor storage for personal items is not available for use during takeoff and landing. The proximity to the galley and lavatory area might be bothersome. 17 F None No Power Seat 17 F is a standard Premium Economy seat that offers additional legroom, seat width, and recline. The seat is located at a bulkhead. A bassinet might be placed on the bulkhead for use by a passenger traveling with an infant. Floor storage for personal items is not available for use during takeoff and landing. The proximity to the galley and lavatory area might be bothersome. 17 G None No Power Seat 17 G is a standard Premium Economy seat that offers additional legroom, seat width, and recline. The seat is located at a bulkhead. A bassinet might be placed on the bulkhead for use by a passenger traveling with an infant. Floor storage for personal items is not available for use during takeoff and landing. The proximity to the galley and lavatory area might be bothersome. 17 H None No Power Seat 17 H is a standard Premium Economy seat that offers additional legroom, seat width, and recline. The seat is located at a bulkhead. Floor storage for personal items is not available for use during takeoff and landing. The proximity to the galley and lavatory area might be bothersome. 17 K None No Power Seat 17 K is a standard Premium Economy seat that offers additional legroom, seat width, and recline. The seat is located at a bulkhead. Floor storage for personal items is not available for use during takeoff and landing. The proximity to the galley and lavatory area might be bothersome. 18 A None No Power Seat 18 A is a standard Premium Economy seat that offers additional legroom, seat width, and recline. 18 C None No Power Seat 18 C is a standard Premium Economy seat that offers additional legroom, seat width, and recline. 18 D None No Power Seat 18 D is a standard Premium Economy seat that offers additional legroom, seat width, and recline. 18 F None No Power Seat 18 F is a standard Premium Economy seat that offers additional legroom, seat width, and recline. 18 G None No Power Seat 18 G is a standard Premium Economy seat that offers additional legroom, seat width, and recline. 18 H None No Power Seat 18 H is a standard Premium Economy seat that offers additional legroom, seat width, and recline. 18 K None No Power Seat 18 K is a standard Premium Economy seat that offers additional legroom, seat width, and recline. 19 A None No Power Seat 19 A is a standard Premium Economy seat that offers additional legroom, seat width, and recline. 19 C None No Power Seat 19 C is a standard Premium Economy seat that offers additional legroom, seat width, and recline. 19 D None No Power Seat 19 D is a standard Premium Economy seat that offers additional legroom, seat width, and recline. 19 F None No Power Seat 19 F is a standard Premium Economy seat that offers additional legroom, seat width, and recline. 19 G None No Power Seat 19 G is a standard Premium Economy seat that offers additional legroom, seat width, and recline. 19 H None No Power Seat 19 H is a standard Premium Economy seat that offers additional legroom, seat width, and recline. 19 K None No Power Seat 19 K is a standard Premium Economy seat that offers additional legroom, seat width, and recline. 20 A None No Power Seat 20 A is a standard Premium Economy seat that offers additional legroom, seat width, and recline. 20 C None No Power Seat 20 C is a standard Premium Economy seat that offers additional legroom, seat width, and recline. 20 D None No Power Seat 20 D is a standard Premium Economy seat that offers additional legroom, seat width, and recline. 20 F None No Power Seat 20 F is a standard Premium Economy seat that offers additional legroom, seat width, and recline. 20 G None No Power Seat 20 G is a standard Premium Economy seat that offers additional legroom, seat width, and recline. 20 H None No Power Seat 20 H is a standard Premium Economy seat that offers additional legroom, seat width, and recline. 20 K None No Power Seat 20 K is a standard Premium Economy seat that offers additional legroom, seat width, and recline. 21 A None No Power Seat 21 A is a standard Economy Class seat located at a bulkhead and might have additional legroom. Floor storage for personal items is not available for use during takeoff and landing. The tray table and inflight entertainment monitor are installed in a fixed armrest, therefore, seat width is slightly reduced. The seat is designated as a Preferred Seat and may be selected for an additional fee. 21 B None No Power Seat 21 B is a standard Economy Class seat located at a bulkhead and might have additional legroom. Floor storage for personal items is not available for use during takeoff and landing. The tray table and inflight entertainment monitor are installed in a fixed armrest, therefore, seat width is slightly reduced. The seat is designated as a Preferred Seat and may be selected for an additional fee. 21 C None No Power Seat 21 C is a standard Economy Class seat located at a bulkhead and might have additional legroom. Floor storage for personal items is not available for use during takeoff and landing. The tray table and inflight entertainment monitor are installed in a fixed armrest, therefore, seat width is slightly reduced. The seat is designated as a Preferred Seat and may be selected for an additional fee. 21 D None No Power Seat 21 D is a standard Economy Class seat located at a bulkhead and might have additional legroom. A bassinet might be attached to the bulkhead for use by an passenger traveling with an infant. Floor storage for personal items is not available for use during takeoff and landing. The tray table and inflight entertainment monitor are installed in a fixed armrest, therefore, seat width is slightly reduced. The seat is designated as a Preferred Seat and may be selected for an additional fee. 21 F None No Power Seat 21 F is a standard Economy Class seat located at a bulkhead and might have additional legroom. A bassinet might be attached to the bulkhead for use by an passenger traveling with an infant. Floor storage for personal items is not available for use during takeoff and landing. The tray table and inflight entertainment monitor are installed in a fixed armrest, therefore, seat width is slightly reduced. The seat is designated as a Preferred Seat and may be selected for an additional fee. 21 G None No Power Seat 21 G is a standard Economy Class seat located at a bulkhead and might have additional legroom. A bassinet might be attached to the bulkhead for use by an passenger traveling with an infant. Floor storage for personal items is not available for use during takeoff and landing. The tray table and inflight entertainment monitor are installed in a fixed armrest, therefore, seat width is slightly reduced. The seat is designated as a Preferred Seat and may be selected for an additional fee. 21 H None No Power Seat 21 H is a standard Economy Class seat located at a bulkhead and might have additional legroom. Floor storage for personal items is not available for use during takeoff and landing. The tray table and inflight entertainment monitor are installed in a fixed armrest, therefore, seat width is slightly reduced. The seat is designated as a Preferred Seat and may be selected for an additional fee. 21 J None No Power Seat 21 J is a standard Economy Class seat located at a bulkhead and might have additional legroom. Floor storage for personal items is not available for use during takeoff and landing. The tray table and inflight entertainment monitor are installed in a fixed armrest, therefore, seat width is slightly reduced. The seat is designated as a Preferred Seat and may be selected for an additional fee. 21 K None No Power Seat 21 K is a standard Economy Class seat located at a bulkhead and might have additional legroom. Floor storage for personal items is not available for use during takeoff and landing. The tray table and inflight entertainment monitor are installed in a fixed armrest, therefore, seat width is slightly reduced. The seat is designated as a Preferred Seat and may be selected for an additional fee. 23 K None No Power Seat 23 K is a standard Economy Class seat that is missing a window. 30 A None No Power Seat 30 A is a standard Economy Class seat located in a last row of the forward Economy Class cabin. Seat back recline might be limited due to the wall of the lavatory directly behind. Also, if the seat back in front is reclined, then personal space will be reduced. The proximity to the galley and lavatory area might be bothersome. 30 B None No Power Seat 30 B is a standard Economy Class seat located in a last row of the forward Economy Class cabin. Seat back recline might be limited due to the wall of the lavatory directly behind. Also, if the seat back in front is reclined, then personal space will be reduced. The proximity to the galley and lavatory area might be bothersome. 30 C None No Power Seat 30 C is a standard Economy Class seat located in a last row of the forward Economy Class cabin. Seat back recline might be limited due to the wall of the lavatory directly behind. Also, if the seat back in front is reclined, then personal space will be reduced. The proximity to the galley and lavatory area might be bothersome. 30 D None No Power Seat 30 D is a standard Economy Class seat located in a last row of the forward Economy Class cabin. Seat back recline might be limited due to the wall of the lavatory directly behind. Also, if the seat back in front is reclined, then personal space will be reduced. The proximity to the galley and lavatory area might be bothersome. 30 F None No Power Seat 30 F is a standard Economy Class seat located in a last row of the forward Economy Class cabin. Seat back recline might be limited due to the wall of the lavatory directly behind. Also, if the seat back in front is reclined, then personal space will be reduced. The proximity to the galley and lavatory area might be bothersome. 30 G None No Power Seat 30 G is a standard Economy Class seat located in a last row of the forward Economy Class cabin. Seat back recline might be limited due to the wall of the lavatory directly behind. Also, if the seat back in front is reclined, then personal space will be reduced. The proximity to the galley and lavatory area might be bothersome. 30 H None No Power Seat 30 H is a standard Economy Class seat. The proximity to the galley and lavatory area might be bothersome. 31 H None No Power Seat 31 H is a standard Economy Class seat. The proximity to the galley and lavatory area might be bothersome. 32 H None No Power Seat 32 H is a standard Economy Class seat located in a last row of the forward Economy Class cabin. Seat back recline might be limited due to the wall of the bulkhead directly behind. Also, if the seat back in front is reclined, then personal space will be reduced. The proximity to the galley and lavatory area might be bothersome. 32 J None No Power Seat 32 J is a standard Economy Class seat located in a last row of the forward Economy Class cabin. Seat back recline might be limited due to the wall of the bulkhead directly behind. Also, if the seat back in front is reclined, then personal space will be reduced. The proximity to the galley and lavatory area might be bothersome. 32 K None No Power Seat 32 K is a standard Economy Class seat located in a last row of the forward Economy Class cabin. Seat back recline might be limited due to the wall of the bulkhead directly behind. Also, if the seat back in front is reclined, then personal space will be reduced. The proximity to the galley and lavatory area might be bothersome. 45 A None No Power Seat 45 A is a standard Economy Class seat located in an Exit Row. There is additional legroom and additional personal space due to the lack of a seat directly ahead. However, the protrusion from the exit door might take away some of the additional legroom. The tray table and inflight entertainment monitor are installed in a fixed armrest, therefore, seat width is slightly reduced. Floor storage for personal items is not available for use during takeoff and landing. The proximity to the galley and lavatory area might be bothersome. 45 B None No Power Seat 45 B is a standard Economy Class seat located in an Exit Row. There is additional legroom and additional personal space due to the lack of a seat directly ahead. The tray table and inflight entertainment monitor are installed in a fixed armrest, therefore, seat width is slightly reduced. Floor storage for personal items is not available for use during takeoff and landing. The proximity to the galley and lavatory area might be bothersome. The seat is designated as a Preferred Seat and may be selected for an additional fee. 45 C None No Power Seat 45 C is a standard Economy Class seat located in an Exit Row. There is additional legroom and additional personal space due to the lack of a seat directly ahead. The tray table and inflight entertainment monitor are installed in a fixed armrest, therefore, seat width is slightly reduced. Floor storage for personal items is not available for use during takeoff and landing. The proximity to the galley and lavatory area might be bothersome. The seat is designated as a Preferred Seat and may be selected for an additional fee. 45 H None No Power Seat 45 H is a standard Economy Class seat located in an Exit Row. There is additional legroom and additional personal space due to the lack of a seat directly ahead. The tray table and inflight entertainment monitor are installed in a fixed armrest, therefore, seat width is slightly reduced. Floor storage for personal items is not available for use during takeoff and landing. The proximity to the galley and lavatory area might be bothersome. The seat is designated as a Preferred Seat and may be selected for an additional fee. 45 J None No Power Seat 45 J is a standard Economy Class seat located in an Exit Row. There is additional legroom and additional personal space due to the lack of a seat directly ahead. The tray table and inflight entertainment monitor are installed in a fixed armrest, therefore, seat width is slightly reduced. Floor storage for personal items is not available for use during takeoff and landing. The proximity to the galley and lavatory area might be bothersome. The seat is designated as a Preferred Seat and may be selected for an additional fee. 45 K None No Power Seat 45 K is a standard Economy Class seat located in an Exit Row. There is additional legroom and additional personal space due to the lack of a seat directly ahead. However, the protrusion from the exit door might take away some of the additional legroom. The tray table and inflight entertainment monitor are installed in a fixed armrest, therefore, seat width is slightly reduced. Floor storage for personal items is not available for use during takeoff and landing. The proximity to the galley and lavatory area might be bothersome. 46 C None No Power Seat 46 C is a standard Economy Class seat. The proximity to the galley and lavatory area might be bothersome. 46 D None No Power Seat 46 D is a standard Economy Class seat that might feature additional legroom due to the location at a bulkhead. A bassinet might be installed on the bulkhead for use by a passenger traveling with an infant. The tray table and inflight entertainment monitor are installed in a fixed armrest, therefore, seat width is slightly reduced. Floor storage for personal items is not available during takeoff and landing. The proximity to the galley and lavatory area might be bothersome. 46 F None No Power Seat 46 F is a standard Economy Class seat that might feature additional legroom due to the location at a bulkhead. A bassinet might be installed on the bulkhead for use by a passenger traveling with an infant. The tray table and inflight entertainment monitor are installed in a fixed armrest, therefore, seat width is slightly reduced. Floor storage for personal items is not available during takeoff and landing. The proximity to the galley and lavatory area might be bothersome. 46 G None No Power Seat 46 G is a standard Economy Class seat that might feature additional legroom due to the location at a bulkhead. A bassinet might be installed on the bulkhead for use by a passenger traveling with an infant. The tray table and inflight entertainment monitor are installed in a fixed armrest, therefore, seat width is slightly reduced. Floor storage for personal items is not available during takeoff and landing. The proximity to the galley and lavatory area might be bothersome. 46 H None No Power Seat 46 H is a standard Economy Class seat. The proximity to the galley and lavatory area might be bothersome. 58 A None No Power Seat 58 A is a standard Economy Class seat located in a last row of the aircraft. Seat back recline might be limited due to the bulkhead wall directly behind. Also, if the seat back in front is reclined, then personal space will be reduced. The proximity to the galley and lavatory area might be bothersome. 58 B None No Power Seat 58 B is a standard Economy Class seat located in a last row of the aircraft. Seat back recline might be limited due to the bulkhead wall directly behind. Also, if the seat back in front is reclined, then personal space will be reduced. The proximity to the galley and lavatory area might be bothersome. 58 C None No Power Seat 58 C is a standard Economy Class seat located in a last row of the aircraft. Seat back recline might be limited due to the bulkhead wall directly behind. Also, if the seat back in front is reclined, then personal space will be reduced. The proximity to the galley and lavatory area might be bothersome. 58 D None No Power Seat 58 D is a standard Economy Class. The proximity to the galley and lavatory area might be bothersome. 58 G None No Power Seat 58 G is a standard Economy Class. The proximity to the galley and lavatory area might be bothersome. 58 H None No Power Seat 58 H is a standard Economy Class seat located in a last row of the aircraft. Seat back recline might be limited due to the bulkhead wall directly behind. Also, if the seat back in front is reclined, then personal space will be reduced. The proximity to the galley and lavatory area might be bothersome. 58 J None No Power Seat 58 J is a standard Economy Class seat located in a last row of the aircraft. Seat back recline might be limited due to the bulkhead wall directly behind. Also, if the seat back in front is reclined, then personal space will be reduced. The proximity to the galley and lavatory area might be bothersome. 58 K None No Power Seat 58 K is a standard Economy Class seat located in a last row of the aircraft. Seat back recline might be limited due to the bulkhead wall directly behind. Also, if the seat back in front is reclined, then personal space will be reduced. The proximity to the galley and lavatory area might be bothersome. 59 D None No Power Seat 59 D is a standard Economy Class seat located in a last row of the aircraft. Seat back recline might be limited due to the bulkhead wall directly behind. Also, if the seat back in front is reclined, then personal space will be reduced. The proximity to the galley area and the positioning of lavatory might be bothersome. 59 F None No Power Seat 59 F is a standard Economy Class seat located in a last row of the aircraft. Seat back recline might be limited due to the bulkhead wall directly behind. Also, if the seat back in front is reclined, then personal space will be reduced. The proximity to the galley area and the positioning of lavatory might be bothersome. 59 G None No Power Seat 59 G is a standard Economy Class seat located in a last row of the aircraft. Seat back recline might be limited due to the bulkhead wall directly behind. Also, if the seat back in front is reclined, then personal space will be reduced. The proximity to the galley area and the positioning of lavatory might be bothersome. 9 A None No Power Seat 9 A is an Open Suite style Business Class seat offering a seat that transforms into a fully-flat bed. The seat is located at a bulkhead and slightly angled towards the aisle. The proximity to the galley and lavatory area might be bothersome. 9 D None No Power Seat 9 D is an Open Suite style Business Class seat offering a seat that transforms into a fully-flat bed. The seat is located at a bulkhead and slightly angled towards the adjacent seat. The seat and the one adjacent are ideal for couples traveling together. The proximity to the galley and lavatory area might be bothersome. 9 G None No Power Seat 9 G is an Open Suite style Business Class seat offering a seat that transforms into a fully-flat bed. The seat is located at a bulkhead and slightly angled towards the adjacent seat. The seat and the one adjacent are ideal for couples traveling together. The proximity to the galley and lavatory area might be bothersome. 9 K None No Power Seat 9 K is an Open Suite style Business Class seat offering a seat that transforms into a fully-flat bed. The seat is located at a bulkhead and slightly angled towards the aisle. A bassinet may be positioned on the bulkhead at this location, therefore, this seat is good for a passenger traveling with an infant. The proximity to the galley and lavatory area might be bothersome. A variety of audio channels are available offering a choice of Israeli and international music selections. Films, documentaries, television programs, and children's programming are featured. All seats in all classes have their own personal inflight entertainment monitors. AC power ports are available at every seat in Business-First and Premium Class. AC power ports are shared in Economy Class. They are located in between the seats of each three seat section. EL AL offers a selection of meal choices and beverages. Many types of special inflight meals such as children's, Glatt, Hindi, Jain, and vegetarian are offered. Special meal selection must be made prior to your flight. Details of availability and time restrictions may be viewed on www.elal.com in the Passenger Information, Onboard, and Food and Beverages section. EL AL Israel Airlines Boeing 787-9 was introduced to the fleet in 2017. The Boeing 787-9 is one of the most advanced, efficient, and technologically equipped passenger aircraft. Seating is configured in three cabins - Business First - offering 32 Open Suites with seats that transform into fully-flat beds, Premium Class - the new Premium Economy product offered by EL AL offering 28 wide seats, increased legroom, and priority service, and Economy Class - offering 222 standard seats with individual seatback monitors and power ports. Great seat! Lots of legroom, very wide seat for me , great service and food! I sat in 15A on a flights from EWR-TLV. The legroom was great and the IFE had lots of choices. However, in bed mode, the footwell is somewhat cramped. The seats 45A and 45K do not have windows. You can crane your neck backwards to get a partial, but very obstructed, view from the windows at 46A and 46K. 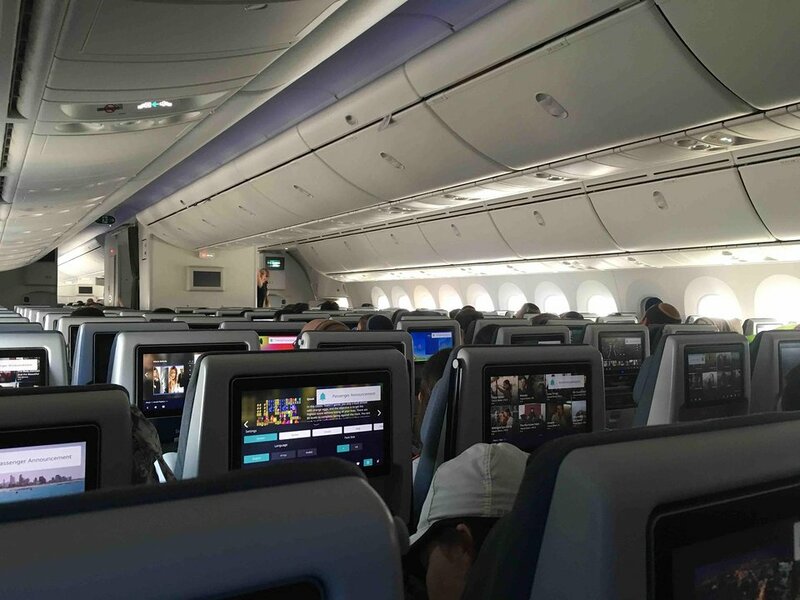 The window seats (A+K) in rows 11, 13 and 15 are less private than those on the even rows - due to passenger's proximity to the aisle; moreover something in their structure requires some tilt of ones head to watch the screen (which is too close). I would not rate these seats as "green". I flew on El Al's Dreamliner twice, once seating at 14A and the other at 13A. The seats are very comfortable, with a full lie flat bad. The movie selection is fantastic with dozens of choices. The service was excellent and attentive. Such an upgrade to their HORRIBLE Business Class seats on the 777/767/747. Seat 21C does indeed have lots of legroom, but it protrudes into the angled aisle, which is extraordinarily narrow to start, making the legroom irrelevant since every cart or person that comes through either bangs your knee or steps on your feet. This seat is a disaster and should be marked RED!! Beyond that, this aircraft is cramped and narrow. El Al chose such narrow seats and crammed in 9 across to negate any benefit of the Dreamliner. Horrible experience. 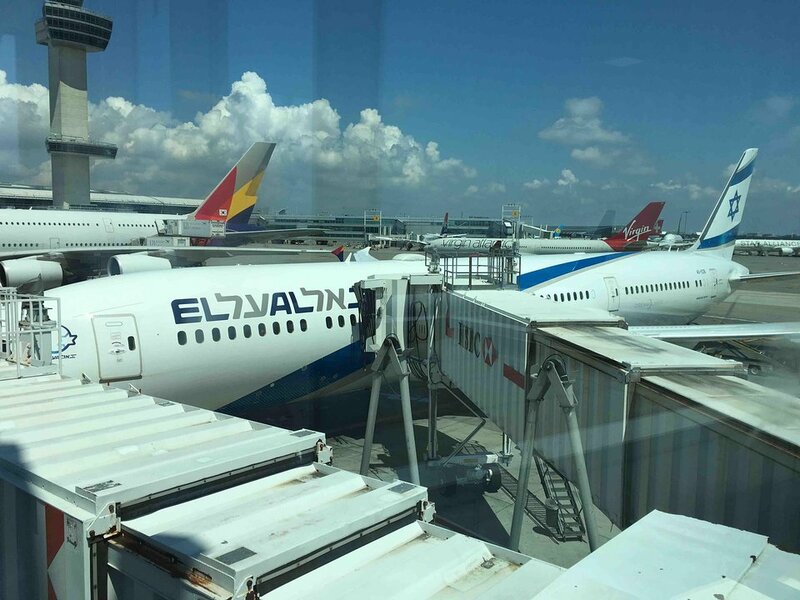 EL AL flies 1 versions of Boeing 787-9.